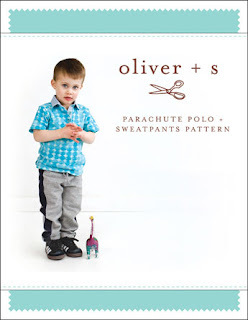 I can now officially say that not only do have all of the Oliver + S patterns but I have also made at least one view of every pattern, including the free ones. I'm caught up once again after a year sewing hiatus. First up is the Carousel Dress. I really like the details in the dress, especially the pockets. Since Miss C suits an A-line style dress therefore I made View B for her, size 7 and used a very dark navy chambray. The dress went together rather quickly, easily and the instructions were clear. I'd like to make this dress again if her mum wants me to. 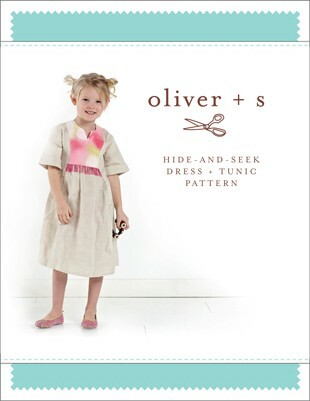 I also like that this dress calls for topstitching details so I used green thread throughout. Next up is the Hide and Seek Tunic/Dress pattern. 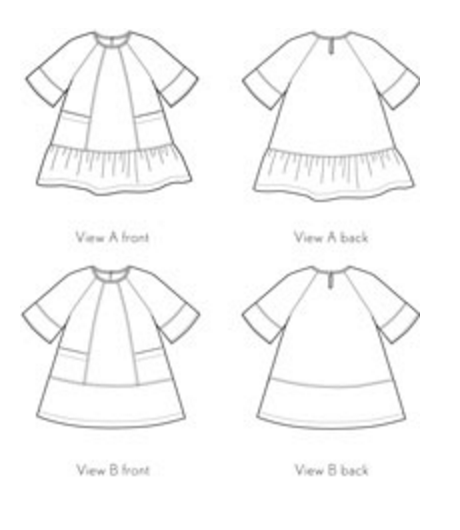 Since Miss C wears a lot of tunic tops, it was a no brainer to make the tunic version, View B with View A sleeves. 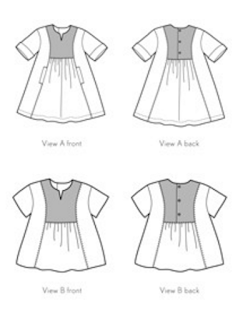 Again, the pattern went together quickly, easily and with a good result. 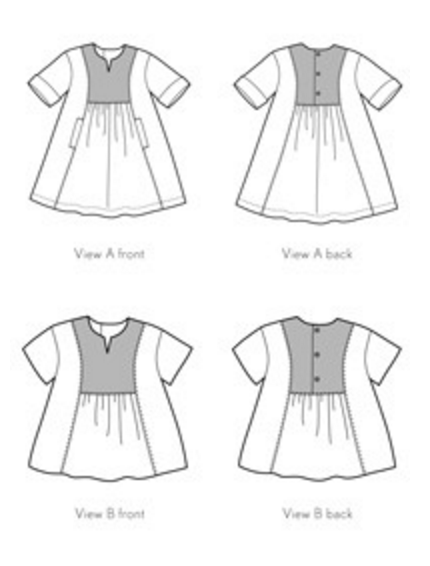 I made size 7 and used brushed cotton for the bodice and sleeves and a cotton twill for the bib section. I am thinking about using the same cotton twill to make skinny jeans to match. All in good time. 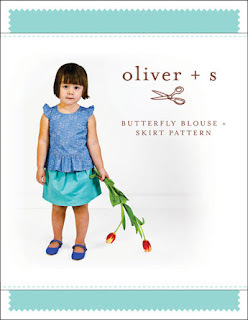 Then I made the Butterfly Blouse and Top. I am more than please with the results of this pattern. The skirt went together in a flash. I used kelly green linen. Size 7. For the peplum blouse, I used a lace cotton and lined it with batiste. She had navy shoes and a navy hair bow to wear with this outfit but the pink shoes, bow and bangles were handy and they work too. The knit top went together quickly but in hindsight, should have used a heavier weight knit. I used a lighter weight ponte de roma but found more stabilizer was needed to keep the pockets from sagging. The Tee is size 7 and it's at bit snug. The culottes on the other hand were a complete fail. I went by the size chart and made her a size 8. They were huge. I even cut off 3 inches from the hem. I won't bother making the culottes until she's older. Right now, she isn't interested in that style. 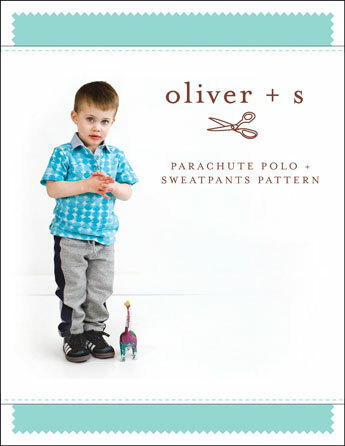 Moving on to the last pattern, Parachute Polo and Sweatpants, I made something for Mr. A. He is 4 years old and usually wears size 5 RTW, therefore I made size 5 and between me taking his measurements and making the shirt, he grew! The buttons need to be added to this shirt but he was a willing model to I seized the moment to get a photo. The lighting in my sewing area is not very good at all. The black collar and placket proved to be a daunting task given poor lighting and I'm not at all happy with the outcome. Talk about using the force while sewing blind! I want to make this shirt again however next time, make the sleeves a little longer and use a lighter coloured collar ..... or stadium lighting if I go with black again. So there we have it. 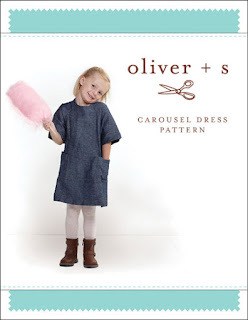 At least one view of all the patterns (including the free ones) from Oliver + S.
I love your version of the Carousel dress. The blue with the green thread is so elegant. 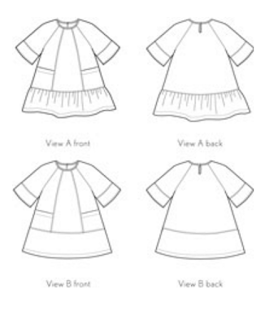 The tunic is very smart and quite a nostalgic look with Miss C's gorgeous bob haircut. I like your LunchBox tee very much, I don't mind the snug fit all all, it certainly doesn't look too snug. 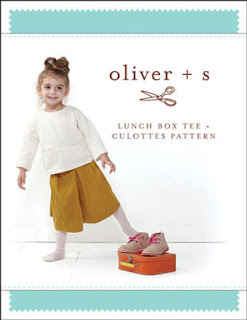 The culottes are a bit of an odd fish. I love Lidia's version (medium weight draping knit) so much, and she wears them at least once a week for school but i have not seen too many other versions that grab me. I think fabric choice is everything with this pattern. The Butterfly is very sweet, I am keen to sew that one soon. I think white is the perfect choice. Mr A is not a baby anymore! He is so grown up in his polo top. You are definitely the O+S Queen! Love them all. You're a legend! They look great - I also like the snugger fit on your Lunchbox; I prefer it to the pattern photo, actually. And the Hide and Seek is great. Oh, Deb, you have been BUSY! I love coming here and finding something new you have made. all of these are so well done!